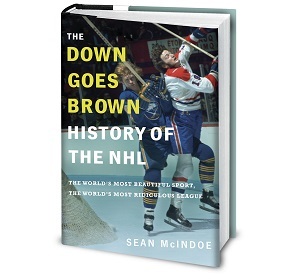 Down Goes Brown: Who has the league's best (and worst) long-term outlook in goal? Who has the league's best (and worst) long-term outlook in goal? Like most great hockey quotes, that old classic came from former coach and broadcast legend Harry Neale. And as we’ve already seen this season, it still holds true for the modern game. A lack of goaltending cost Ken Hitchcock his job in St. Louis, torpedoed a Stanley Cup contender in Dallas, and is threatening to derail promising young teams in Calgary, Philadelphia and Winnipeg. Even a few bad games from a backup can leave a coach ranting and raving, as we found out a few days ago. Goaltending is critical. It can also be frustratingly hard to find, let alone to lock up for the long term. If you’ve got a good one, you’d better find a way to hold onto him, because stability at the position can make or break a franchise’s Stanley Cup dreams. So today, let’s go through all 30 NHL teams and ask a simple question: From worst to best, how good should everyone feel about their goaltending situation, not just right now but for the next five years? The Hurricanes have had the worst goaltending in the league this year apart from Dallas, and their coach just finished throwing Eddie Lack under the bus and backing it over him a few times. When Cam Ward, who hasn't had a season north of .910 in five years, is your bright spot, you've got goaltending problems. There is a decent prospect in the system in 2014 second-rounder Alex Nedeljkovic; in a perfect world, maybe he's ready to take over after Ward and Lack's deals both expire in 2018. But this looks like an area where GM Ron Francis is going to need to roll up his sleeves and get to work. Goaltending situations don't come with many more question marks than the Flames'. They have a solid prospect coming in Jon Gillies, although he's battled injury and inconsistency. But both of their goalies are scheduled to hit the UFA market this summer, and it's quite possible that neither is re-signed before then. That's not necessarily a bad thing, given how inconsistent play at the position has haunted the team all season. Chad Johnson was excellent at the start of the year and Brian Elliott has been better lately, but the Flames were rumoured to be in the market for names like Ben Bishop and Marc-Andre Fleury at the deadline, so a fresh start here seems likely. Most teams on the low end of this list are here because they don't have a starting goaltender locked up for the long term. The Avalanche are here because they do. Like just about everything related to this year's team, the Avalanche goaltending has been a disaster. Semyon Varlamov struggled and then got hurt, and was eventually shut down for the year. It marked the third straight year of declining play for the one-time Vezina runner-up, but he's locked up through 2019 on a big-ticket deal so the Avalanche might be stuck with him. Maybe the expansion draft bails them out here, and Colorado can start fresh with Calvin Pickard or someone else. If not, they'd better hope Varlamov can get healthy and back to his 2014 form, because a $5.9-million backup would be one more problem for a team that already has plenty.